Working at the office or home that requires you to use double computers is quite a hassle. It stresses you even more and strains your neck and eyes. Thanks for the new technologies and great ideas today, because there is a new invention, which is the dual monitor stand that carries two monitors in a one unit. No more head turning from side to side and moving from one place to another! With a dual monitor stand, you will only focus on one corner with two monitors attached together in front of you. Here are the 6 best dual monitor stands that will draw your attention! Vivo dual monitor stand can hold two monitors up to 27 inches and at 17.6 lbs each. You might think two screens with its own weight and height can be heavy for just a simple dual monitor. However, this device from Vivo is designed to be sturdy enough since it is made of high grade aluminum and steel. The base is super solid, which is why it can handle two monitors at the same time. What’s more, the bottom base is built with protective padding so it will not create scratches on your table. Move it around to 360 degrees, tilt it up to 45 degrees and even swivel it up to 360 degrees to suit your viewing needs. Mount-it! Dual Monitor Stand has an adjustable spring arm height up to 13 inches. It holds two desktop screens with a height from 13 inches to 27 inches. It also comes with an integrated cable management, where you can neatly organize the cables at the back. The monitors can be installed in either landscape or portrait shape depending on how you want to view it. The arm can be modified to tilt the screen up to 90 degrees, rotate up to 360 degrees, and swivel up to 180 degrees (two joints) and 360 (one joint). Duronic DM352 is engineered with two adjustable arms that flexibly position the desktop monitors. The mounts are suitable for both desktop monitors and flat screen TVs of size 13 inches to 27 inches. The stand can hold a desktop of weight up to 17 lbs. You can even turn the monitor around for optimal convenience. The mount also enables you to move the double arms up and down and swivel them left and right to 360 degrees to get a better view based on your sitting position. An additional strong clamp is included in the package to secure stability and durability. 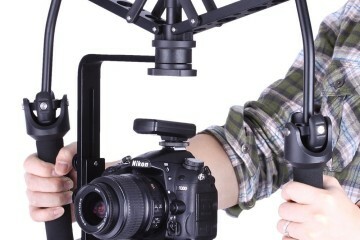 Featured with aircraft-grade aluminum arms, the Loctek stand D5HD provides an anti-scratch surface. So, do not get worried about wear and tear because this dual monitor stand is designed to prevent scratches. The mount can hold two monitors of weight from 8.8 to 22 lbs each. The anti-scratch arms can be adjusted to support a convenient working stations and to prevent body strains. It also comes with a gas spring hovering system that modifies the height of the monitor. It also has a cable management where you can place the cables neatly and orderly. Unlike other dual stand monitors, this HP monitor stand only supports desktops up to 24 inches, but the monitors can be rotated to portrait or landscape orientation. This unit is engineered with a dual hinged design that allows you to adjust the height, tilt, and move around for maximum comfort. And since this is a product of HP, it is compatible to use with any HP desktop monitors with the required size. What’s more, it can also be used with LCD displays and notebook PCs with 24 diagonal inches considering they have 100-mm VESA mounting pattern so they will be able to fit in. The dual monitor stand from 3M is indeed a space-saving unit as it can handle two desktop monitors of weight at 20 lbs and height at 27 inches. To add more space on your workstation, you can purchase a laptop tray attachment with this MA260MB unit. To reduce eye, back, and neck pain, you can simply move the monitors and adjust the arms up and down to your preferred height. Also, you can even move the arms side to side or in and out when you want to share the screens with others.